It is a polypeptide and secreted from the duodenal mucosa. It causes contraction of intestinal smooth muscle and regulates interdigestive motility (migrating motor complex). It is found in the mucosa of ileum. The secretion is stimulated by fatty acids. Its actions include: Inhibition of GI motility and increase in ileal blood flow. It is found in the endocrine cells of GI tract and it stimulates motility of small intestine. This hormone may enter the circulation. It has 27 amino acid residues and the first 10 amino acid residues resemble amphibian bombesin. It is secreted from vagal endings on the G cells and causes gastrin release. It is secreted from the D cells of GI tract, D cells of islets of pancreas and hypothalamic neurons. There are two forms S14 and S28. 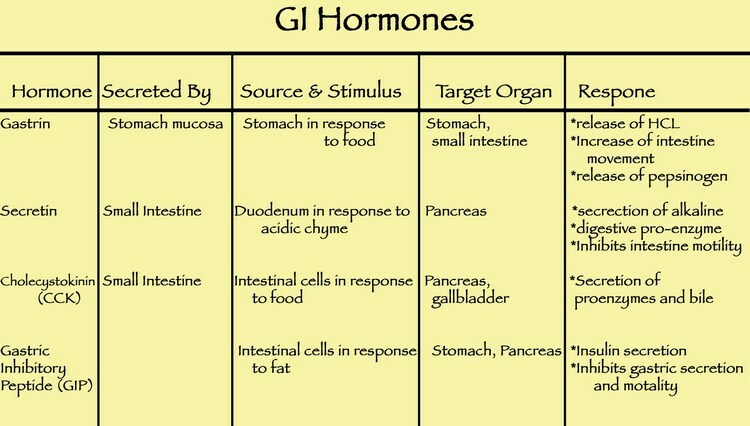 In GI tract, it causes inhibition of gastrin, secretin, VIP, GIP and motilin. The secretion of somatostatin in the GI tract is stimulated by the acid in the lumen. It inhibits gastric acid secretion and motility. It also inhibits pancreatic exocrine secretion. The gallbladder contraction, absorption of glucose, amino acids and triglycerides are inhibited by this hormone. Glucagon secretion from GI tract in diabetes mellitus assumes significance in accentuating hyperglycemia. These are opioid peptides and the important among them is dynorphin. Its secretion helps to regulates GI tract secretion and motility. This peptide gut hormone has been recently discovered. It is secreted from the jejunum of the small intestine in response to fat in the diet. Its main action is to inhibit gastric secretion and motility. It acts on the hypothalamus and inhibits appetite. The peptide YY hormone has been considered as a candidate for gastric inhibitory peptide ( GIP). It a peptide hormone secreted from the stomach. It is also involved in the control of food intake. It stimulates appetite and increases food intake. Its level in the blood is increased during fasting and reduced in obese individuals. The hormone ghrelin has receptors in the anterior pituitary and stimulates the secretion of growth hormone secretion.